A year after becoming the first team in league history to repeat as champions, Questionable Outfit became the first team to win three consecutive titles, winning game four 17-7 and sweeping Cookies & Cream to become 2016 Ellsworth Wiffleball League champs. 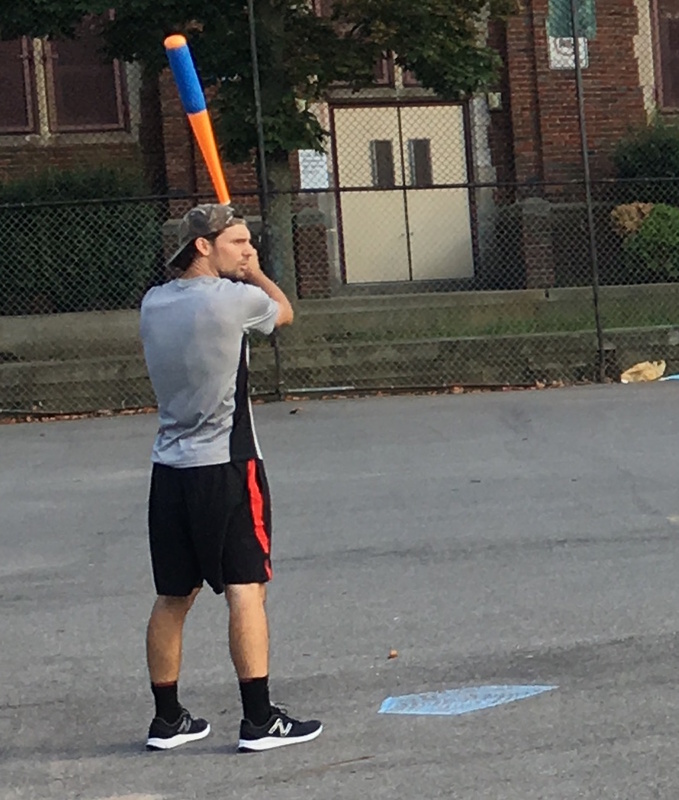 Questionable Outfit pulled away early and kept their foot on the gas, running away with the title and maintaining their seat upon the wiffleball throne. Bob hit four home runs in the game and pitched the complete game win, and Tom pitched in five hits, including three homers. 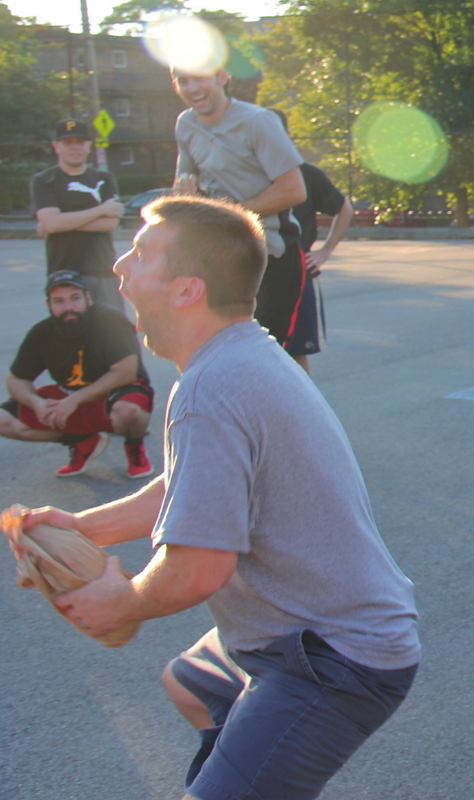 After getting swept by Cookies & Cream in the 2013 Wiffle Series, Questionable Outfit won the 2014 series in five games, the 2015 series in six games, and became the first team in EWL history to go a perfect 7-0 in the playoffs, sweeping both of their 2016 series. Questionable Outfit won the first three games of the series during the previous week, and had Cookies & Cream on the ropes heading into game four. Cookies started Joey on the mound for the third consecutive game. He had pitched well in a game two loss, and started game three effectively before being hit hard later in the outing. Questionable Outfit jumped on him immediately in game four and made the path very challenging for Cookies & Cream to extend the series. After Joey retired Bob to start the game, Kimble doubled, and he scored when Mike hit an RBI single to make the score 1-0. Miller then followed with a double, scoring Mike, and the score was 2-0. Bob cleared the bases with a two-run homer, and Questionable Outfit had taken a 4-0 lead with only one out in the game. 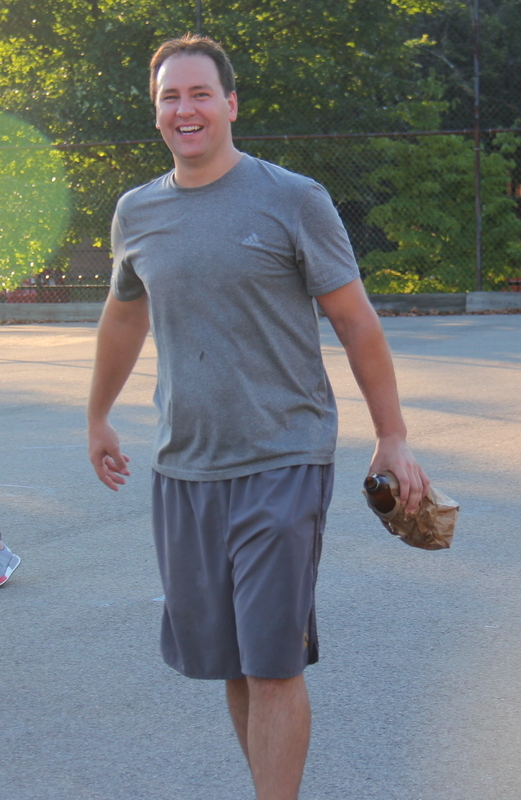 Joey finally escaped the inning, retiring Tom, but Cookies were in a big hole in the series and the game. Bob, who had won game two in a pitcher’s duel with Joey, started game four for Questionable Outfit. He retired the side in order in the bottom of the first, sending Guthrie and Blose down consecutively. Questionable added to their lead in the top of the second. Mike singled, and two batters later, Bob hit his second two-run blast of the game, putting Questionable ahead 6-0. Joey retired Tom, and Cookies & Cream trailed by six. Jordan hit a one out single for Cookies & Cream in the bottom of the second, but he didn’t advance beyond first, as Bob retired Guthrie to strand the runner and end the inning. Already ahead by six runs, Questionable Outfit piled on in the top of the third. Cookies & Cream had seen enough from Joey, and turned to Guthrie from the bullpen. The first batter he faced, Mike, crushed a solo homer to left, and Questionable led 7-0. Miller followed with a single, and Bob hit his third two-run homer in as many at-bats, putting Questionable Outfit in front 9-0. Tom then tripled, and he scored when Mike drove him in with an RBI double. Mike was caught for the first out, trying to extend the double into a triple. Guthrie then retired Miller to end the inning, and Questionable Outfit led 10-0. Cookies & Cream got on the board in the bottom of the third and made what would otherwise be a blowout interesting. Blose led off the inning with a solo homer that made the score 10-1. Joey singled, and two batters later Guthrie singled to put runners on first and third with one out. Blose hit a double, scoring Joey, and Cookies had made the score 10-2. Joey came to the plate with one out and two runners on, and he hit an RBI single that cleared the bases, cutting the deficit to 10-4. Bob retired Jordan to strand the runner and end the inning. 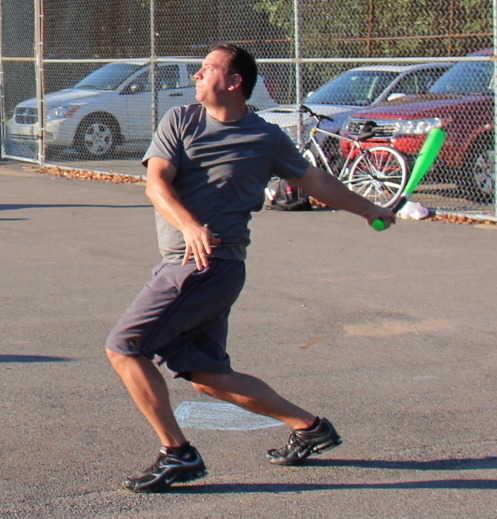 Cookies had cut the ten-run hole to only six, but Questionable got out their bats again in the top of the fourth. Bob led off the inning with a double, and Tom followed with a two-run homer that extended the Questionable lead to 12-4. Guthrie was removed from the mound, and in a desperation move, Jordan made his his first pitching appearance of the postseason for Cookies & Cream. He retired the first batter he faced, Mike, but the second batter he faced, Miller, his a solo shot to left, making the score 13-4. Jordan then retired Bob to end the inning, and one inning after cutting the deficit to six runs, Cookies & Cream now trailed by nine. Miller connects on a pitch. He had four hits, including two singles, a double, and a homer. Cookies continued to show heart in the bottom of the fourth, cutting into the Questionable lead. Guthrie singled, and he moved from first to third when Blose followed with a double. Joey then hit an RBI double off the fence, emptying the bases and making the score 13-6. It looked as if Cookies may rally, but Bob hammered down, retiring Jordan and Guthrie to end the inning and avoid further damage. Questionable added another run to their lead in the top of the fifth when Tom led off with a solo homer, his second bomb of the game. Miller would single with one out later in the inning, but Jordan retired Bob to strand the runner and end the inning with the score 14-6. 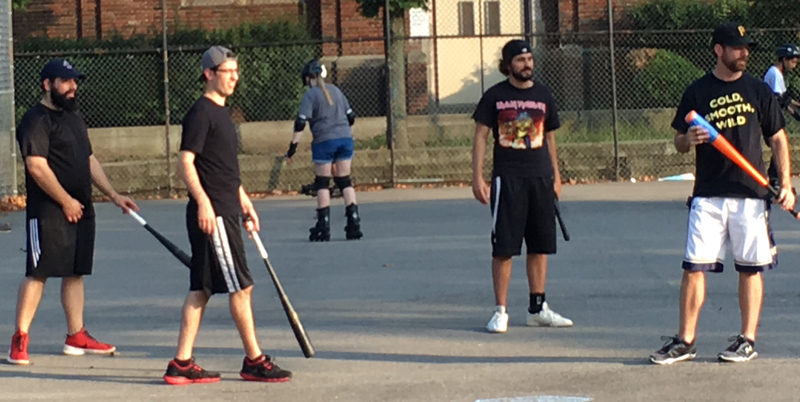 Bob cruised through the bottom of the fifth, retiring Blose and Joey in order, and Questionable Outfit led by eight runs, one inning away from a title. Questionable Outfit would pile on a few more runs in the top of the sixth. Tom started the inning with a solo homer, his third consecutive at bat with a blast, and the score was 15-6. Mike followed with a solo shot, his second of the game, and the back-to-back jacks put Questionable Outfit ahead 16-6. Jordan was removed from the mound, and Blose became the fourth Cookies & Cream pitcher to appear in the game. He retired the first batter he faced, Miller, but Bob followed with his fourth homer of the game, a solo shot that gave Questionable Outfit a 17-6 lead. 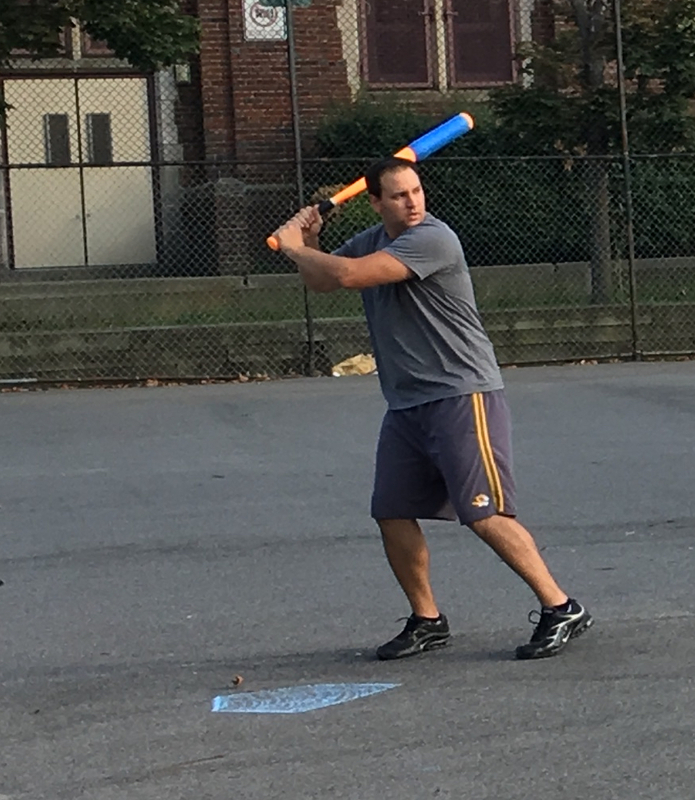 Blose retired Tom for the second out of the inning, and Cookies & Cream trailed by eleven runs heading into what would likely be their final at-bat of the 2016 season. Bob remained in the game to close things out for Questionable Outfit. He retired Guthrie for the first out of the inning, and Questionable was one out away from being crowned champions. Blose hit a one-out single, and he moved to third when Joey followed with a double. Cookies & Cream had one out and two runners in scoring position, down to their final out. Jordan hit a high fly ball to center field. Tom settled under it, caught the ball for the second out of the inning, and Questionable Outfit united in the middle of the wiffle diamond as champions of the wiffle world. Questionable Outfit had completed a four game sweep of their rivals Cookies & Cream, winning their third consecutive title. 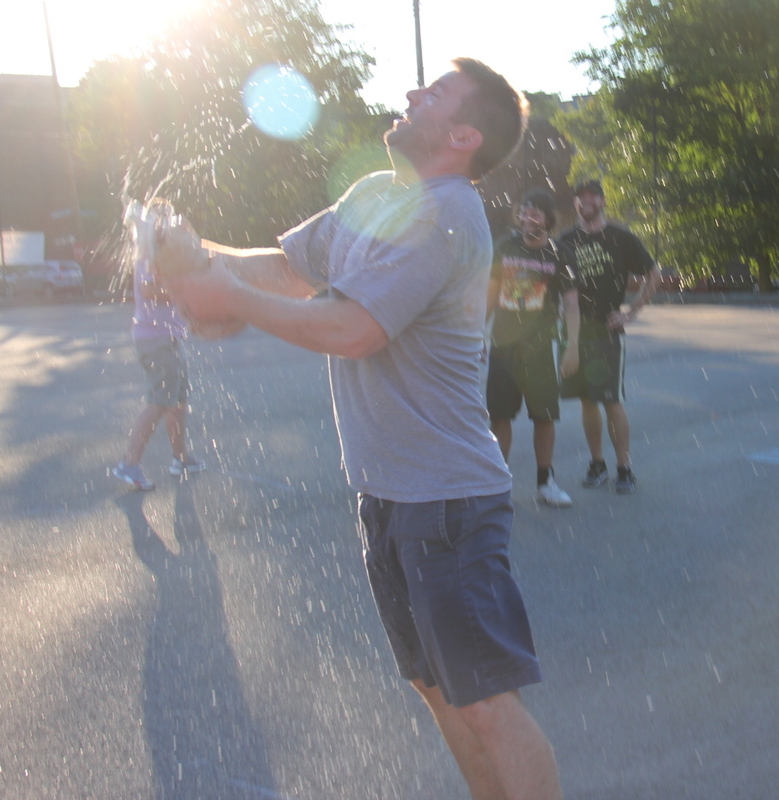 Mike gets Questionable Outfit’s post-game celebration started by cracking open the championship trophy, the PBR 40 oz. – Bob pitched the complete game win for Questionable Outfit, allowing 7 runs on 12 hits in 6 innings. – Joey took the loss for Cookies & Cream, giving up 6 runs on 6 hits in 2 innings. – Guthrie, Jordan, and Blose each pitched in relief for Cookies & Cream. Guthrie allowed 6 runs on 7 hits in one inning, Jordan gave up 4 runs on 5 hits in 2 innings, and Blose surrendered a single run on one hit in one inning pitched. – Bob led Questionable Outfit on offense, going 5-for-8 with a double, four home runs, five runs scored, and seven RBI. 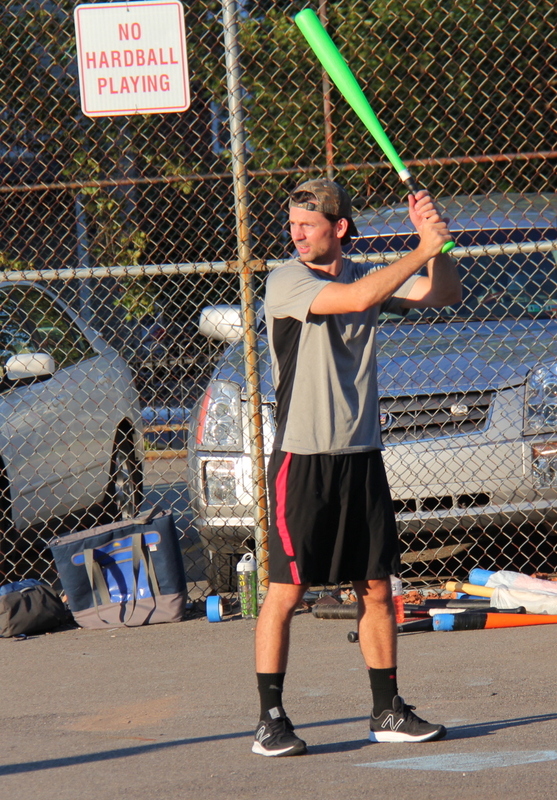 – Tom also went 5-for-8 for Questionable Outfit, with a double, a triple, three home runs, five runs scored, and four RBI. – Blose led Cookies & Cream at the plate, going 4-for-6 with a single, two doubles, a home run, three runs scored, and two RBI. – Joey also went 4-for-6 for Cookies & Cream, with two singles, two doubles, one run scored, and four RBI. Bob pitched the complete game win, keeping Cookies & Cream in check the entire game. He also went 2-for-4 with a double and a homer, and his solo shot in the fourth put Questionable ahead for good. 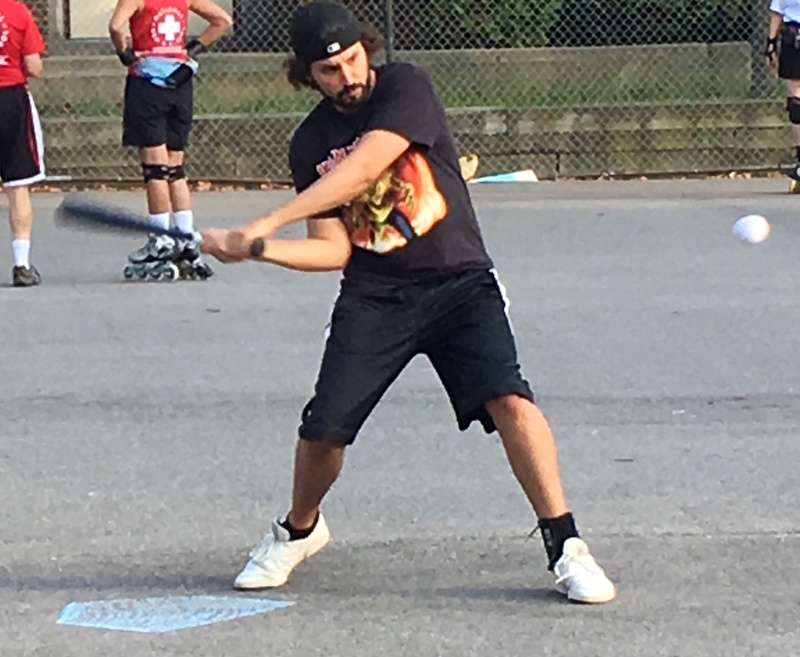 Bob went 2-for-4 with a double and a homer and allowed only one run and five hits on the mound as he led Questionable Outfit to a 3-1 win over Cookies & Cream in game two of the Wiffle Series. Questionable Outfit now has a 2-0 lead in the best-of-seven series and needs only two more wins to win the EWL championship for the second consecutive season. After Miller sparked Questionable to victory at the plate and on the mound in game one, Bob took the mound and looked to the same for his squad in game two. Cookies & Cream got some base hits in the top of the first, but they couldn’t capitalize. Blose singled with one out, and Joey followed with a single to put runners on the corners, and Cookies threatened. But Bob got out of the jam, getting Jordan to fly out to left, stranding both runners and ending the inning. Joey took the mound for Cookies & Cream after earning the victories in games 4 and 5 of their first round series with the Ham Slams. He allowed a one-out double to Tom in the bottom of the first, but he also avoided trouble, retiring Mike to end the inning, and the game was scoreless through one. Bob cruised through the top of the second, retiring Guthrie and Blose in order, and his team would get on the board in the bottom half of the inning. 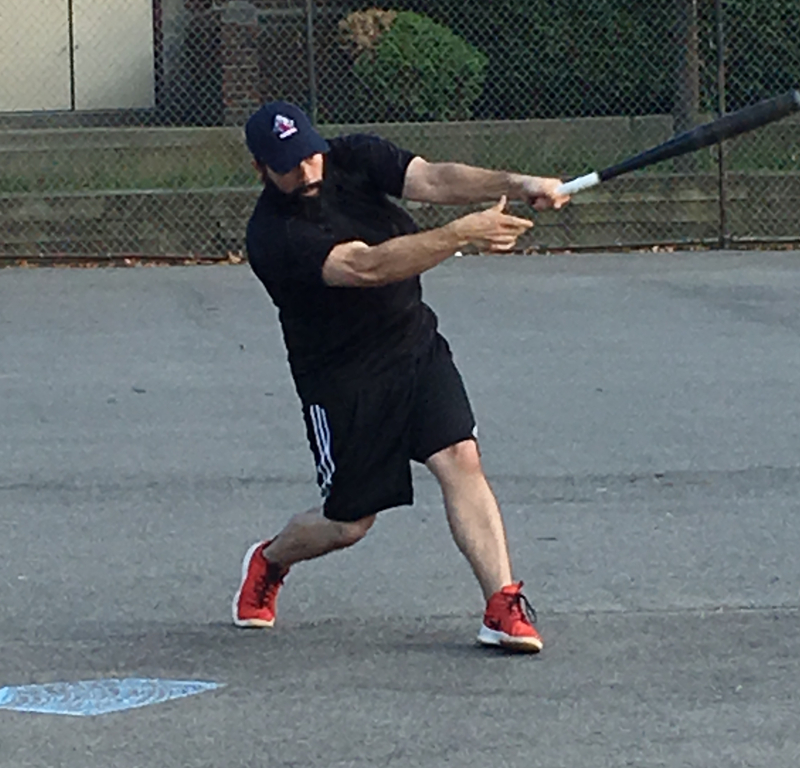 Miller continued to swing a powerful bat, and after two homers in game one, he hit a solo shot in game two, putting Questionable ahead 1-0. Bob followed with a double, but a relay from the outfield caught him just as he was about to complete a triple, and Cookies had one out. Tom was retired for the second out of the inning, and Cookies trailed by a run. Joey was effective on the mound, allowing only three runs to Questionable, but he also provided the only run Cookies scored when he hit a solo homer in the second. Joey helped himself out in the top of the third, leading off the inning with a solo homer to left, tying the game at 1-1. Jordan followed with a double, but Cookies couldn’t take the lead, as Bob retired Guthrie and Blose to strand the runner at second and end the inning. Joey retired the side in order in the bottom of the third, sending Mike and Miller down consecutively. The game remained tied at 1-1. Bob matched him in the top of the fourth, retiring Joey and Jordan. Questionable would pull ahead in the bottom of the fourth inning when Bob launched a solo shot to right-center. Tom followed with a single, but Joey stranded him, retiring Mike and Miller. With Questionable ahead 1-0, Bob continued to send Cookies hitters down. He cruised through the top of the fifth, as Guthrie and Blose were sent down in order. Questionable would add another run of support in the bottom of the fifth. Tom tripled with one out, and Mike drove him in with an RBI single. Joey retired Miller to end the inning, and Questionable led 3-1 heading into the top of the sixth. Joey doubled to lead off the top of the second, and the tying run would have been at the plate, but Mike threw a laser from left that caught Joey’s toe as he was advancing from second to third, and Bob had the first out of the inning. 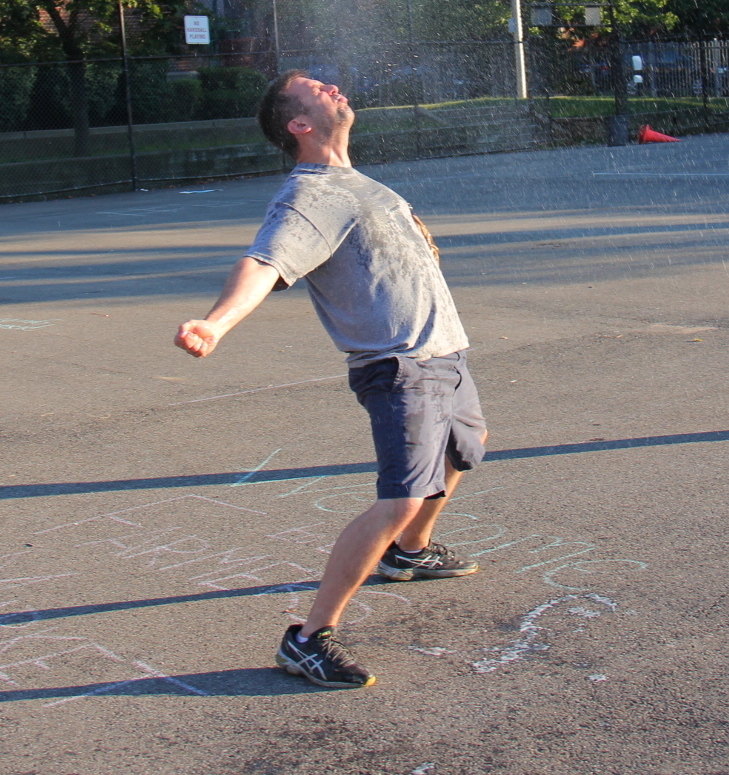 Cookies & Cream’s momentum was immediately squashed, and Bob retired Jordan for the second out of the inning, ending the game. 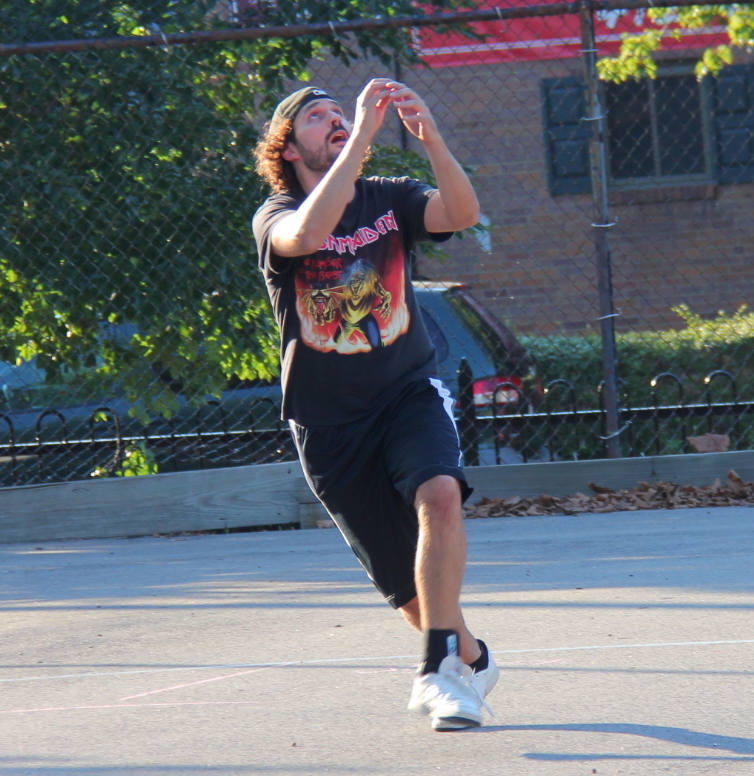 Questionable Outfit’s 3-1 win gave them a 2-0 lead in the best-of-seven championship series. 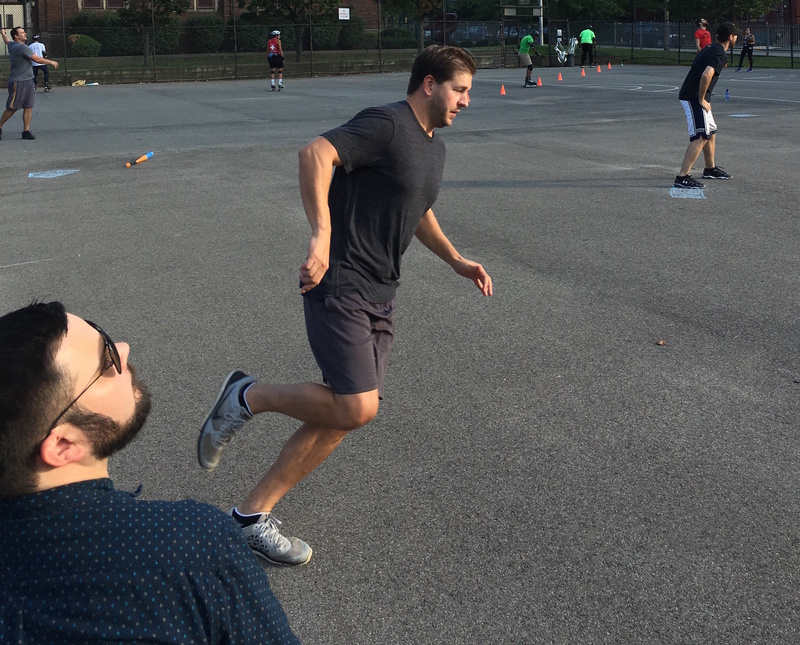 Questionable had held home field advantage, and will serve as the road team for games 3 and 4. – Bob pitched the complete game win for Questionable Outfit, giving up one run on five hits in six innings. – Joey took the loss for Cookies & Cream, allowing three runs on seven hits in five innings. 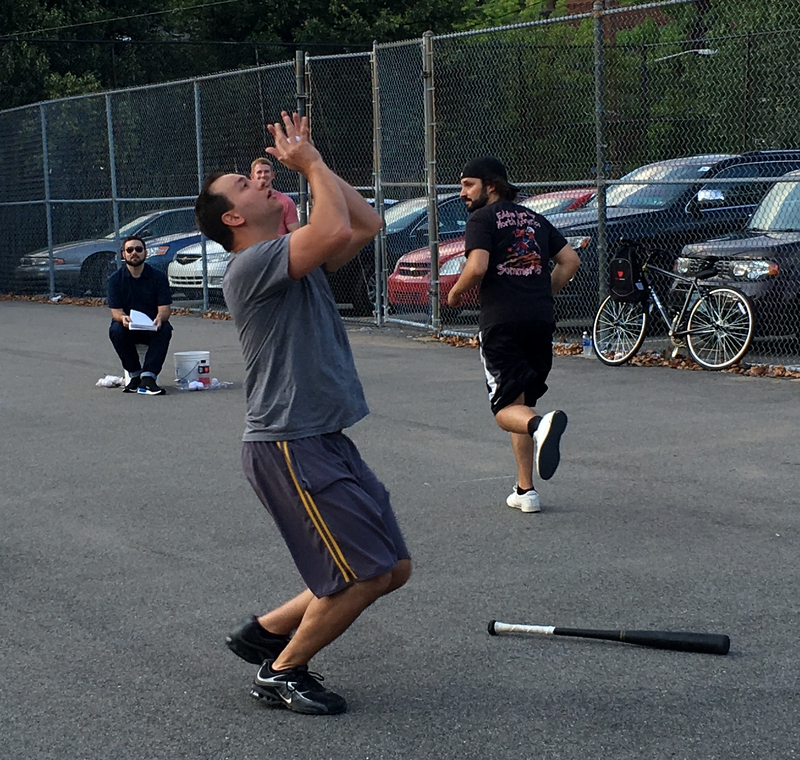 – Tom led Questionable Outfit at the plate, going 3-for-4 with a single,a double, a triple, and a run scored. – Bob also went 2-for-4 for Questionable, with a double, a homer, a run scored, and an RBI. – Joey led Cookies & Cream on offense, going 3-for-4 with a single, a double, a home run, a run scored, and an RBI. 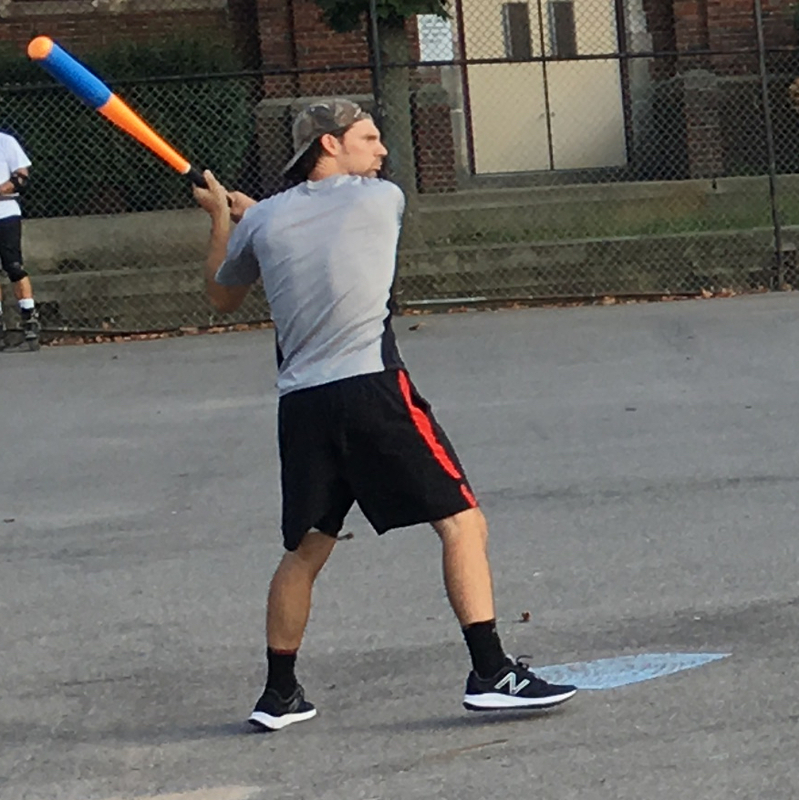 Miller pitched the complete game win, hit two homers, and drove in four runs as Questionable Outfit took game one of the 2016 EWL Wiffle Series from Cookies & Cream 7-4. 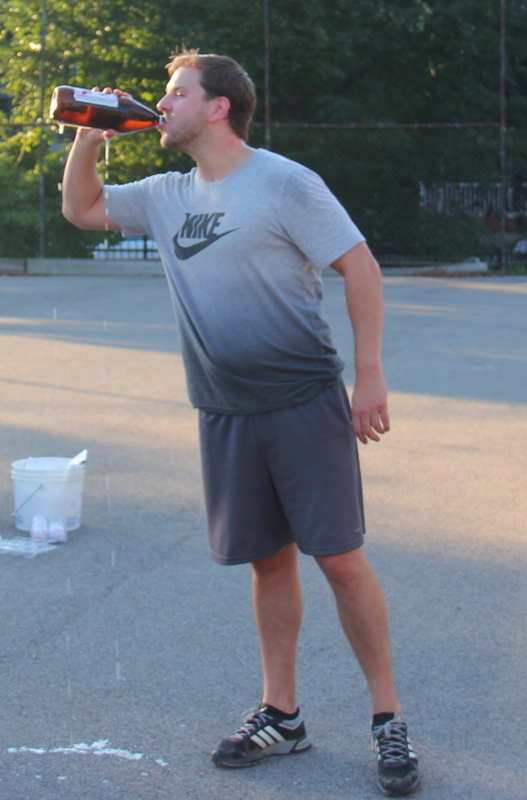 Cookies & Cream rallied to tie the score after Questionable pulled ahead early, but Miller’s home runs led a late game surge by Questionable Outfit that put the game out of reach. 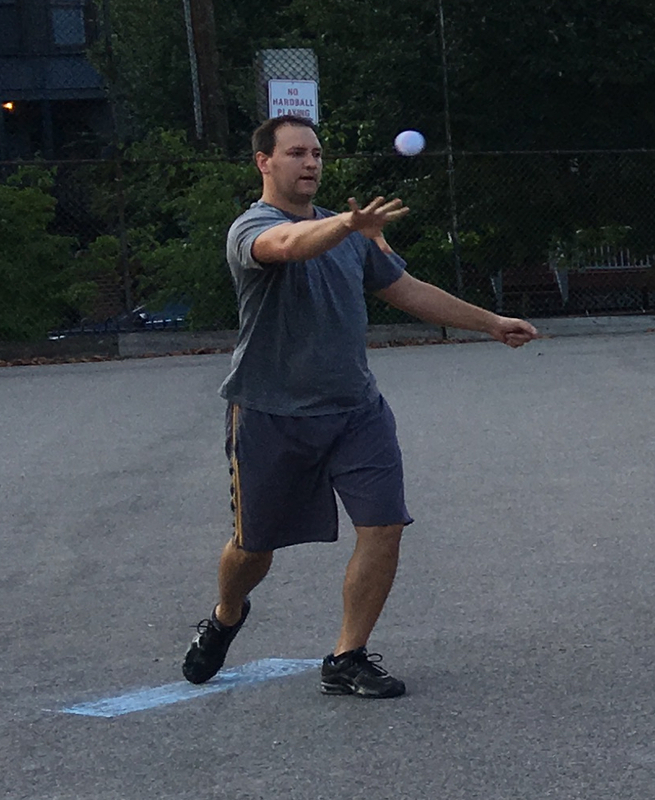 Cookies & Cream and Questionable Outfit are meeting in the Wiffle Series for the fourth consecutive season, as Questionable looks to three-peat as EWL Champions and Cookies hopes to avenge two straight years of losing in the championship series and return to their 2013 championship form. Cookies & Cream get ready to face Questionable Outfit in the Wiffle Series for the fourth consecutive season. Cookies topped Questionable in 2013, but have lost the past two series in ’14 and ’15. Miller, Questionable’s ace, started on the mound in game one, and he got off to a solid start, retiring Guthrie and Blose in order in the top of the first. Guthrie took the mound for Cookies & Cream, and Questionable Outfit got to him early. Bob led off the game with a single, and Tom followed with an RBI double to make the score 1-0. Mike followed with a double to put runners on second and third, and Tom scored when Miller grounded out to left for the first out of the inning. Mike advanced to third, but Questionable couldn’t plate another run. Bob grounded out to right to end the inning, and Questionable led 2-0 after one. Cookies & Cream bounced back in the top of the second to take the lead. Jordan doubled with one out, and Guthrie followed with a two-run homer to tie the game at 2-2. Blose then hit a solo shot, and the back-to-back jacks put Cookies & Cream ahead 3-2. Miller retired Joey to end the inning, and Questionable trailed by a run. Tom led off the bottom of the second with a solo homer to left, and Questionable tied the game at 3-3. Mike followed with a double, and two batters later, Bob hit a one out single, but Mike was caught in between third and home trying to score on the play to end the inning with the score tied. Jordan led off the top of the third with a single, but he was caught trying to advance the hit into a double. Miller then retired Guthrie to end the inning. Questionable would pull ahead in the bottom of the third. Mike singled with one out, and Miller provided his own run support, hitting a two-run blast to left-center, and the score was 5-3. Bob followed with a solo homer, and the back-to-back homers put Questionable Outfit in front 6-3. Tom followed with a double, his second of the game, but the inning would end there, as Guthrie retired Mike for the second out to strand the runner. Blose singled to start the top of the fourth, but Cookies couldn’t rally, as Miller retired Joey and Jordan to strand the runner and end the inning. Bob singled with one out in the bottom of the fourth, but Questionable couldn’t extend their lead, as Guthrie retired Tom for the second out of the inning. Blose hit a one-out triple in the top of the fifth, but once again Cookies couldn’t plate the run, as Miller fanned Joey to strand the runner and end the inning. Miller would add one insurance run and provide his own run support in the bottom of the fifth. With one out, he hit a solo homer, his second round tripper of the game, and Questionable led 7-3. Guthrie retired Bob to end the inning, and Cookies would head into their final at-bat of game one trailing by four. Jordan led off the top of the sixth with a solo homer, cutting the deficit to 7-4, and Cookies had hope with the top of the lineup coming up. Miller, however, buckled down, retiring Guthrie and Blose in order to end the inning and the game. Questionable Outfit had taken game one of the best-of-seven Wiffle Series 7-4, and were three wins away from a third consecutive title. – Miller pitched the complete game win for Questionable Outfit, allowing four runs on seven hits and striking out one in six innings. – Guthrie took the loss in the complete game effort, giving up seven runs on twelve hits in six innings. – Bob went 4-for-6 to lead Questionable on offense. He had three singles, a homer, two runs scored, and an RBI. – Tom also went 3-for-5 for Questionable with two doubles, a home run, two runs scored, and two RBIs. – Blose led Cookies & Cream at the plate, going 3-for-5 with a single, a triple, a home run, a run scored, and an RBI. – Jordan went 3-for-4 for Cookies with a single, a double, a home run, two runs scored, and an RBI. 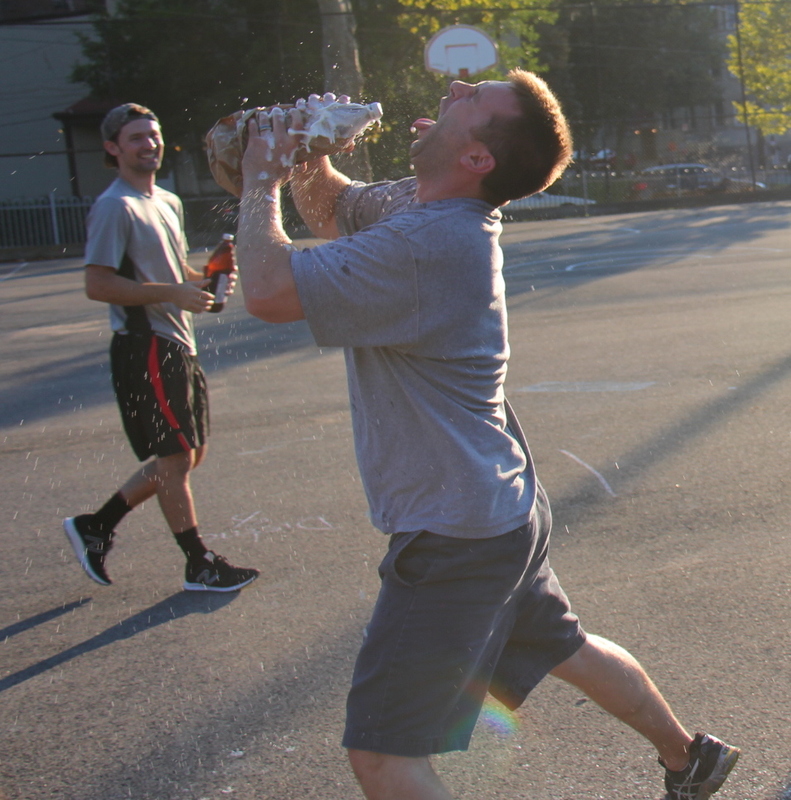 The 2016 Ellsworth Wiffleball League Wiffle Series Championship commences tonight at 6:30PM at the Wiffle Diamond in Shadyside as Questionable Outfit will face off against rivals Cookies & Cream in a best-of-seven series to determine the league champion. Two-time defending champions Questionable Outfit, led by three-time defending Wiffler of the Year Bob, will look to become the first team to three-peat as EWL champs. 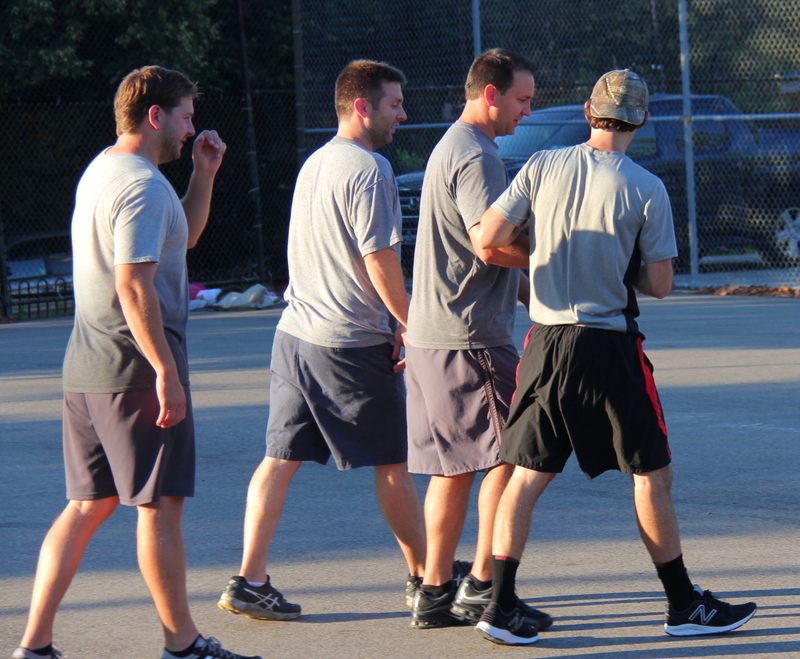 Cookies & Cream, the 2013 EWL champions, will look to avenge losses to Questionable Outfit in the past two Wiffle Series. 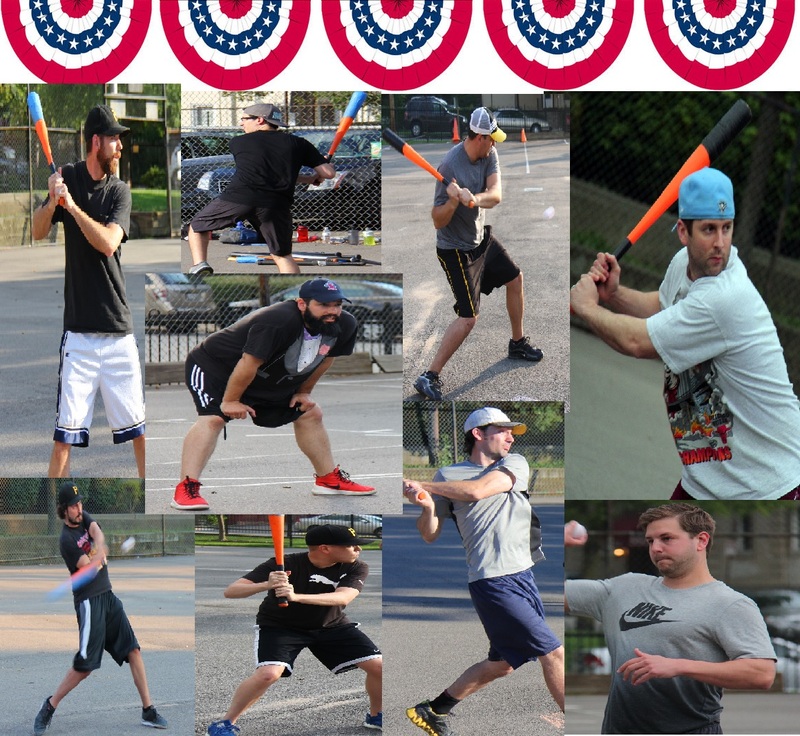 In it’s 6th year of existence, the Ellsworth Wiffleball League is a four team adult wiffleball league in Shadyside. The 20-game regular season begins in May, and a champion is crowned in August. 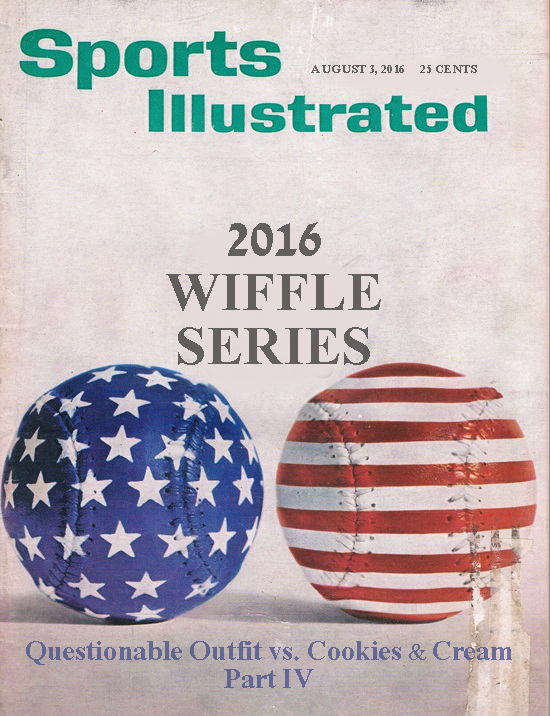 The 2016 season is nearing a conclusion, and the champion will be decided in a best-of-seven series with Questionable Outfit serving as the home team for games 1, 2, 5, and 7. 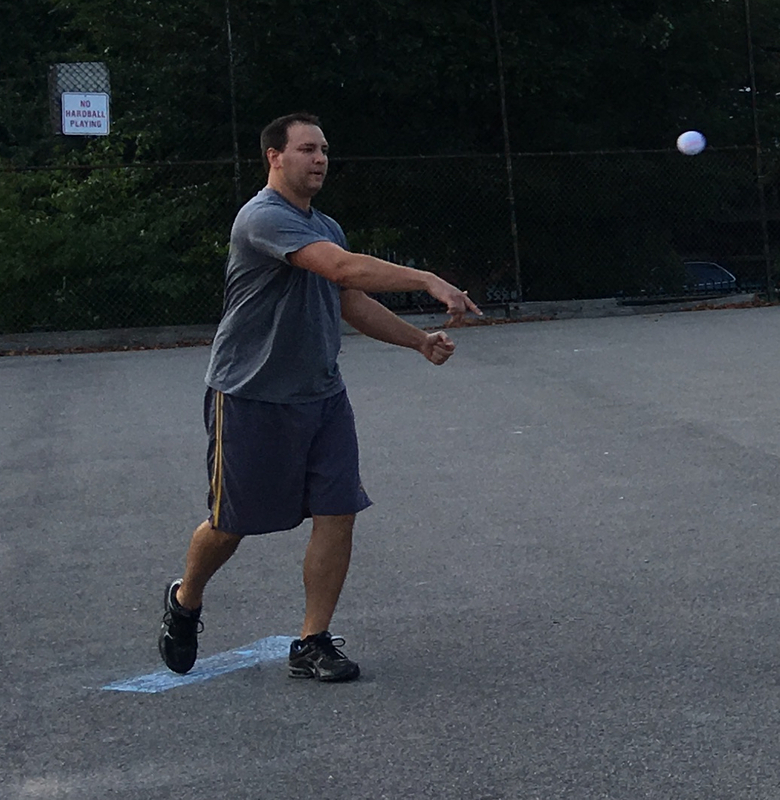 Cookies & Cream defeated the Ham Slams in game 5 of their best-of-five first round series to advance to the 2016 Wiffle Series. 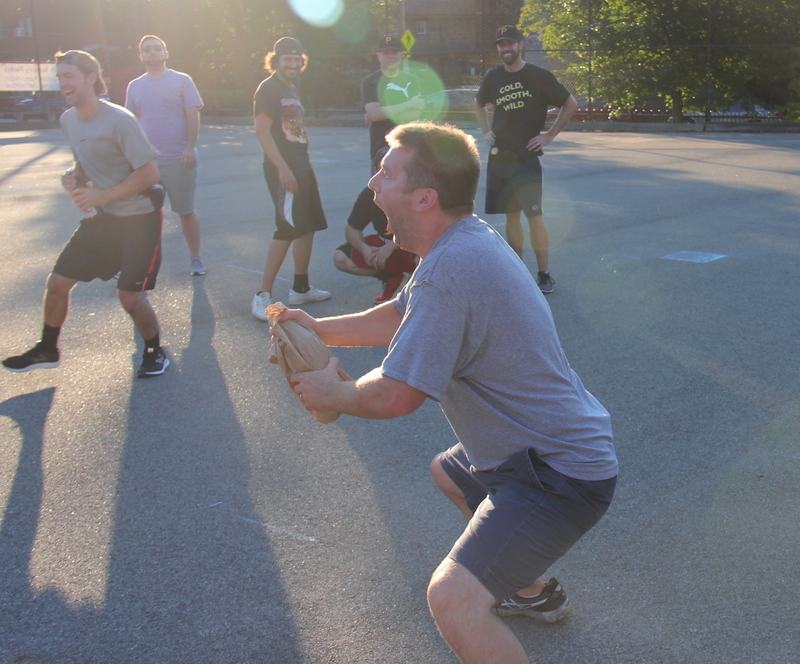 Their opponents, Questionable Outfit, were the 2016 regular season EWL Pennant winners and swept Eastbound & Dahn in their first round series to advance to the title series. Cookies & Cream and Questionable Outfit met seven times in the regular season, with Questionable Outfit winning the season series 4-3. The series was tied 3-3 heading into the final game of the regular season, when Cookies & Cream led late but succumbed to a Questionable Outfit comeback that clinched the #1 seed and pennant. Questionable Outfit boasts a powerful offense led by Wiffler of the Year candidate Bob, one of the league’s most dangerous hitters in Tom, EWL Pitch King candidate Miller, and one of the game’s finest fielders, Mike. Cookies & Cream has a consistent offense and a strong pitching attack led by Pitch King candidate Guthrie, the game’s most feared hitter Blose, a hobbled veteran in Joey, rookie Jordan, and one of league’s most clutch hitters Dinger. The first four games of the series will take place tonight, and barring a sweep, the series will conclude next week.